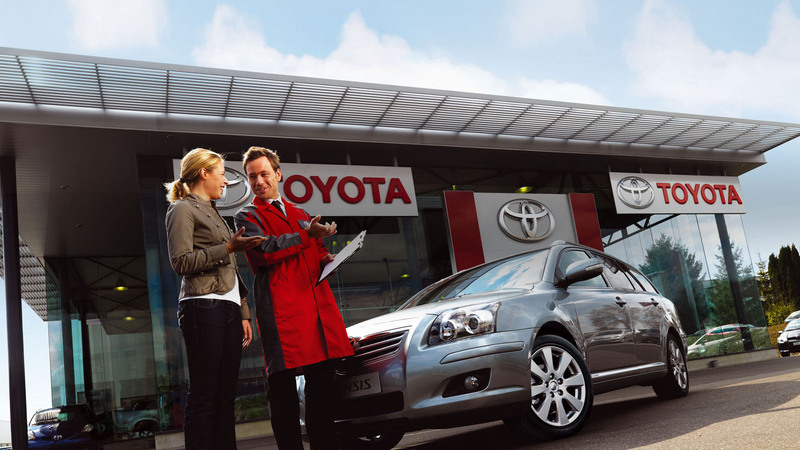 Welcome to ToyotaService.ie which is designed to provide Toyota Owners with clear prices for a range of routine service items on vehicles supplied by Toyota Ireland since 2000. Founded in 1937, Toyota Motor Corporation has grown to become the largest car company in the world. Toyota has been voted the most admired motor vehicle company globally and ranks first for quality and social responsibility within the car industry. Industry observers regard Toyota as the most efficient and highest quality producer of motor vehicles, laying testament to the 'Best Built Cars in the World' tag. For further information regarding the Toyota Motor Corporation, visit the Toyota Global website. Introduced into the Irish market in 1972 Toyota Ireland is a 100% Irish owned company responsible for the sale and distribution of Toyota passenger cars, commercial vehicles and genuine parts and accessories through its network of 46 dealerships and 16 Authorised Repairers located throughout Ireland. For information on offers that apply to your Toyota, please enter your registration number on our home page and select the service item due on your car. You can then book a service either on this site or directly via a participating Toyota Dealer/Authorised Repairer. If your car is not included, please contact your local Toyota Dealer/Authorised Repairer who may be able to assist you. All of the prices quoted on this website include the required Toyota Genuine Parts, labour, oil (where required) and VAT at the applicable rate. All of the work is as per manufacturers recommended service schedules and is covered by a 1 year warranty. Many Toyota Owners choose to save money by taking out a service plan with their preferred Toyota Dealer / Authorised Repairer. Serviceplan from Toyota can be purchased for any new or used Toyota vehicle or for your existing Toyota vehicle. Talk to your local Toyota Dealer/Repairer today to get your personalised quotation. For more information on Serviceplan, please click here.